The Stanley Cup Final is tied and both teams are optimistic, oddly enough. The Pittsburgh Penguins were up 2-0 on the Nashville Predators, but the home team took home back-to-back wins at the Bridgestone Arena. The Predators lost Game One and Game Two, despite outshooting the Penguins and dominating possession time. And the Penguins lost Game Four by a final score of 4-1, despite playing some of their best hockey of the series. So, what’s it going to take for a team to play solid hockey and win? That’s the riddle. The Penguins know they have some questions to answer, starting in goal. Matt Murray allowed a combined eight goals on 58 shots in Game Three and Game Four. That could mean the starting gig falls to Marc-Andre Fleury for Game Five in Pittsburgh. Scoring is also an issue for the Penguins, at least recently. Pittsburgh has been outscored 9-2 in the past two games, with only Jake Guentzel and Sidney Crosby finding the net. Evgeni Malkin and Phil Kessel have been ineffective as of late and the Penguins aren’t going to win if they can’t find any secondary scoring. The Predators, meanwhile, seemed to have found the pocket. They didn’t practice on Tuesday following their 4-1 Monday win and will be ready for Game Five on Thursday, with a practice scheduled for Wednesday. But they’ve got some issues. The Penguins had more shot attempts than the Predators in Game Four, but they couldn’t convert the stat to the scoreboard. Kessel was one Penguins who didn’t seem to revel in the increased shot attempts in Game Four and didn’t seem to be thinking offensively. He has just one goal in his past nine games and no goals in his past six. Nashville received top-tier goaltending from Pekka Rinne and that’s a sure key to victory. Rinne was stellar in Game Four in particular, improving to a 1.88 goals against average and a .932 save percentage. He has two shutouts in the 2016-2017 playoffs. Nashville may have managed to shut down the Penguins’ offence due to Rinne finding his groove at the right time but they’ve also pulled their own offence to the fore, with scoring coming from all corners of the roster. 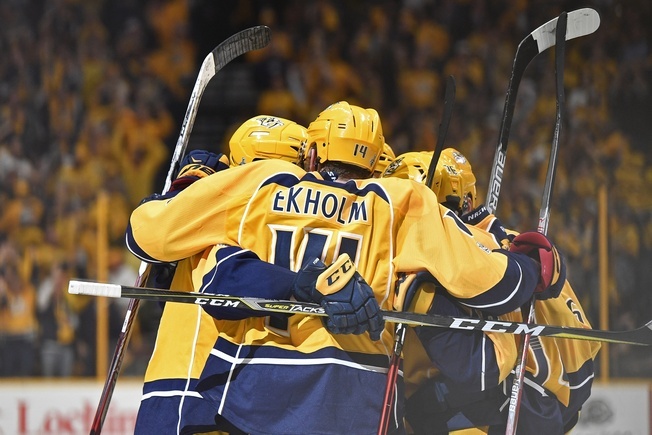 Filip Forsberg, Viktor Arvidsson and Calle Jarnkrok have been playing excellent hockey, while Frederick Gaudreau has come out of nowhere to score three goals in the Stanley Cup Final. Game Five of the Stanley Cup Final is set for Thursday.